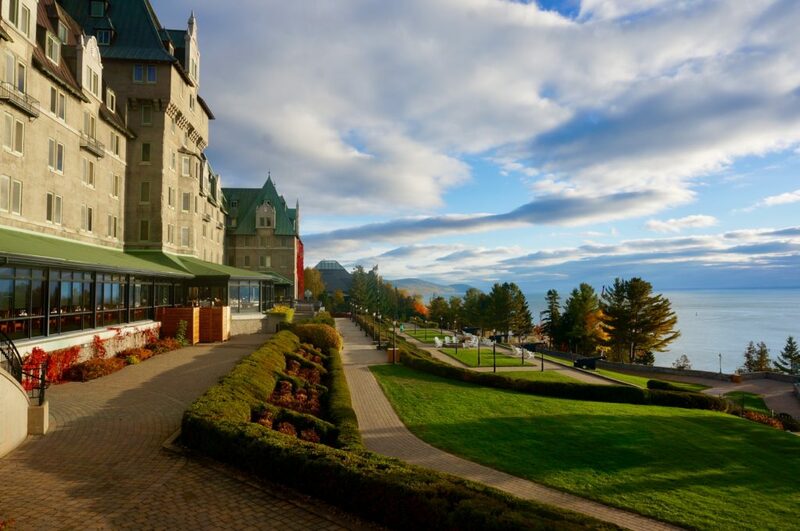 Looking at the manicured grounds and castle-like façade of the Fairmont Le Manoir Richelieu in La Malbaie, Quebec, it’s not hard to imagine folks in 1900’s-era attire disembarking from a steamship and heading up the walkway, followed by porters lugging steamer trunks full of luggage. The hotel, which was originally built in 1899 by a steamship cruise line operating on the Saint Lawrence River, still retains a distinctive turn-of-the-century feel. Today, however, the 405-room hotel plays home to visitors looking to explore the mountains, towns, and parks of Quebec’s scenic Charlevoix region, to hit the links on the hotel’s 27-hole golf course, or perhaps to try their luck at the adjacent Casino de Charlevoix. As guests of the hotel on a recent visit, we stayed in a deluxe room that was spacious enough to make the king-sized bed look like a twin. The room had expansive views of the river, and I found myself rising early to catch the sunrise and hoping to glimpse of a beluga whale, which are occasionally spotted there. The hotel itself, which played host to the June 2018 G-7 meeting of world leaders, is a sprawling affair with grand hallways, five restaurants and plenty of areas to enjoy a meal or a drink while looking out over the Saint Lawrence River. It also boasts two heated outdoor pools and a Jacuzzi, as well as a heated indoor pool, all great options for relaxing and warming up after spending a chilly fall day out and about. Our visit started before we got to the hotel, as we made several stops on Le Route des Saveurs, or Flavor Trail, which highlights local producers and restaurants featuring cider, chocolate, beer, cheese and other gastronomic delights from the Charlevoix region. Up first on our list was Le Saint Pub in the artsy town of Baie St. Paul, where we tried a few craft beers from the Microbrasserie Charlevoix, located just a few kilometers away – the hearty milk stout was perfect for a fall day. 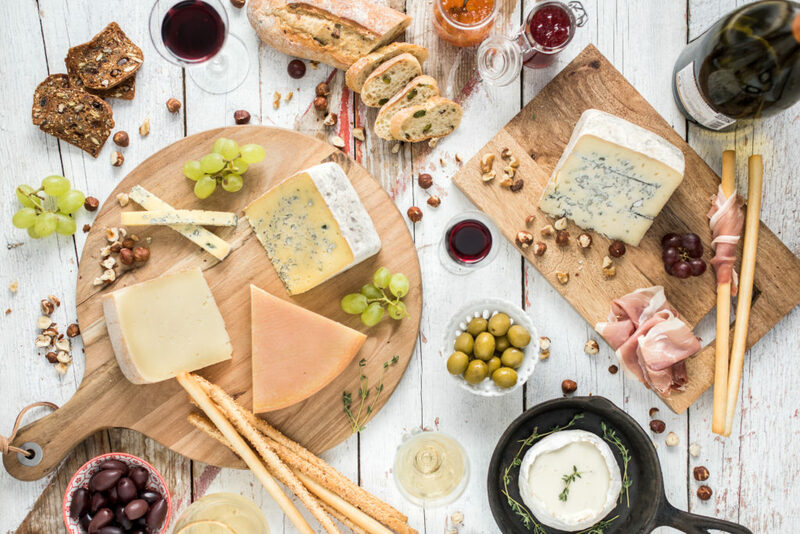 Having tried some local cheese at the pub, and being good cheese-loving Vermonters, we next headed to le Maison d’Affinage Maurice Dufour to try the renowned Le Migneron de Charlevoix cheese, as well as some of their other offerings. We toothpicked our way through all samples they had to offer, and decided to buy some Tomme de Brebis, a deliciously aromatic sheep-milk cheese, to enjoy later in the evening with a glass of wine. We arrived to the Manoir Richelieu in the early evening, and spent the night there exploring the hotel grounds. Knowing we had to get an early start in the morning, we had a light snack and a beer at the hotel’s La Brise bar and turned in early. The next day we made the easy 45-minute drive to the Hautes-Gorges-de-la-Rivière Malbaie National Park to go for a hike. 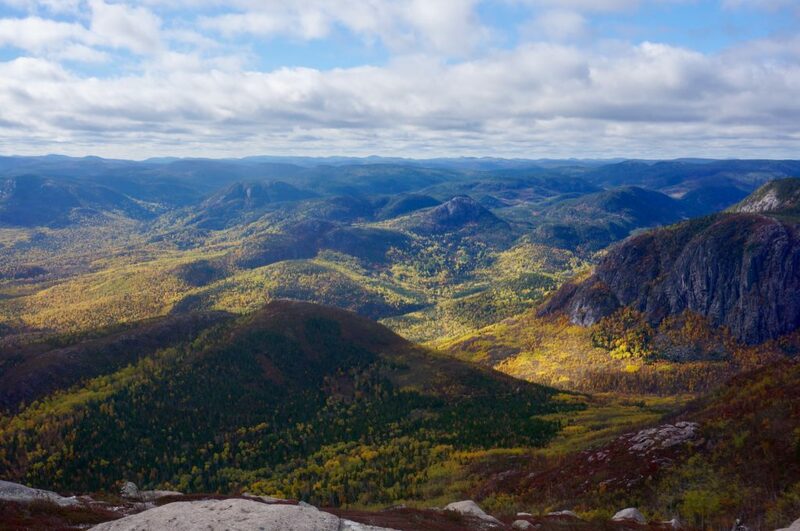 We had done some research and had decided to try the L’Acropole-des-Draveurs – a roughly 7-mile round trip trail up into the Laurentian Mountains. What we didn’t know was that it was the last day the trail would be open for the season, so hundreds of other folks – almost all Québécois judging by their license plates – were also heading up. In addition to the hiking traffic, as the trail rapidly ascended we found ourselves having to carefully navigate ice-covered rocks. 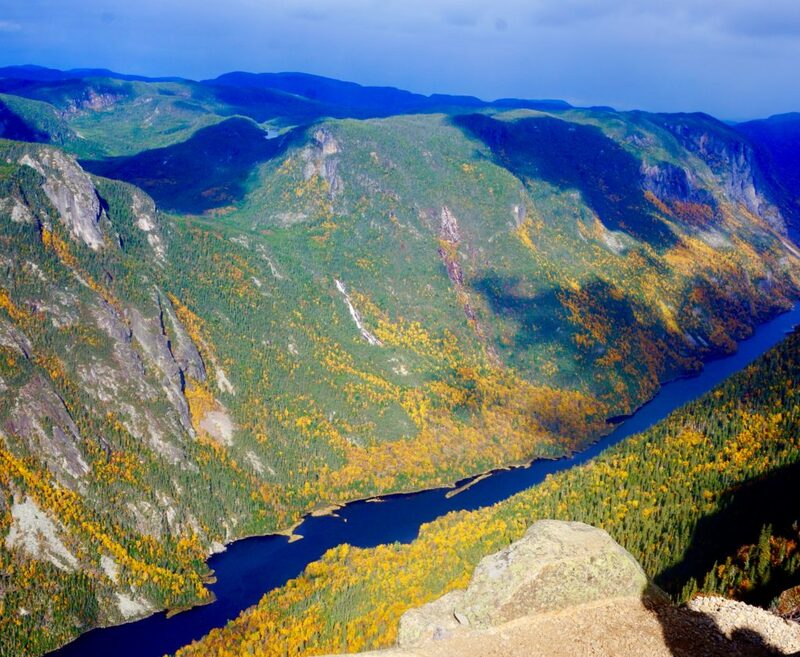 Despite the slow-going, we reached the first overlook on the trail and were rewarded with truly spectacular views from the top of some of the highest rock faces east of the Rockies, taking in the surrounding mountains and the Malbaie River below. 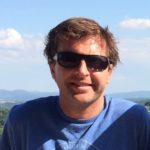 After hiking all day in wintery conditions, we were ready to warm up – so we headed straight to the hotel were we donned the fluffy white robes from our room and went to the heated outdoor pool to relax. After soaking for a half hour, we had to force ourselves out of the warm water and make a dash for our robes and back to the shelter of our room. To cap off the day’s activities we first tried our hand at the casino slots (pleased to come out slightly ahead), and then headed to the hotel’s game room where we competed in a quadrathlon of sorts, comprised of pool, ping-pong, air hockey, and foosball. On our last day we fueled up with the hotel’s extensive buffet breakfast, and then headed for the other national park within easy driving distance: Parc National des Grands-Jardins. The park, named for its ‘great gardens’ of colorful lichen carpets and Arctic vegetation, has plenty to offer climbers, hikers, rock climbers and anglers. We chose to hike the popular Le Mont-du-Lac-des-Cygne, a moderate 8-mile round-trip hike that ends with incredible 360-degree views from the rim of the Charlevoix Crater, a 56 km diameter meteor impact crater created over 300 million years ago. Feeling satisfied that we had packed in enough activity for the weekend, we hiked back to the car and began the drive home, both wishing we were instead heading back to the heated pool, cozy bar, and comfortable room at Le Manoir Richelieu.